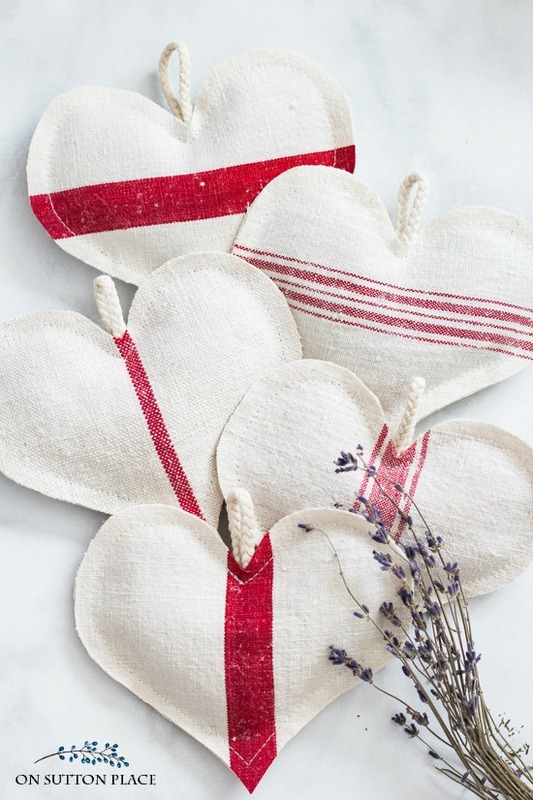 DIY Grain Sack Lavender Heart Sachets. 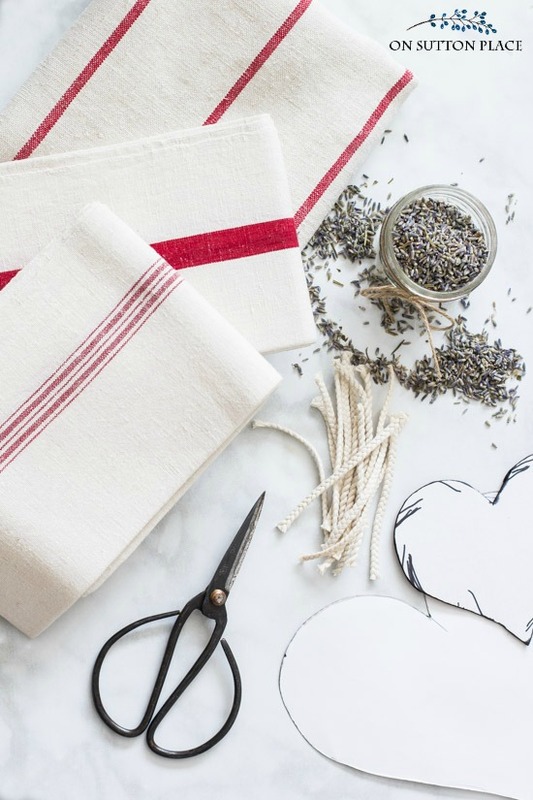 Easy directions for making these sweet sachets. Perfect for Valentine’s Day or Sweetest Day. Easy Valentine’s Day decor. 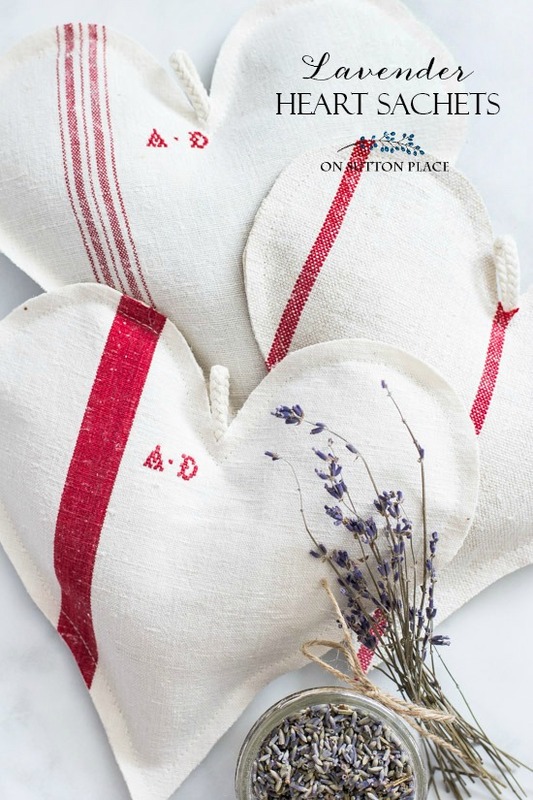 With Valentine’s Day less than a month away, it’s the perfect time to make these DIY Grain Sack Lavender Heart Sachets. They make a lovely gift…for someone else or for yourself. They do require a little bit of sewing but if you don’t have a machine, hand-stitching will work just as well. 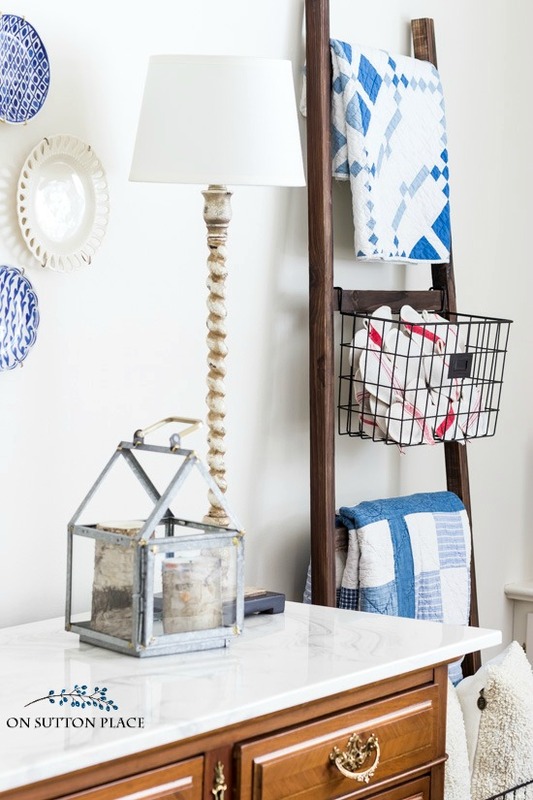 For this project, I used part of one antique grain sack and two different antique tea towels. If you are wondering about the “AD,” the tea towels came with the initials already embroidered. My method for making heart sachets uses one cut-out heart and one bigger piece of backing fabric. It’s so much easier than trying to sew two hearts together and keep them lined up. Tip: Sometimes, if you’re very lucky, you can find antique grain sacks with the ties still attached. These ties make perfect hangers. The hangers shown in these photos were made from tiny braided cording I got at Joann. I could not find it on their website. Iron your grain sack fabric. 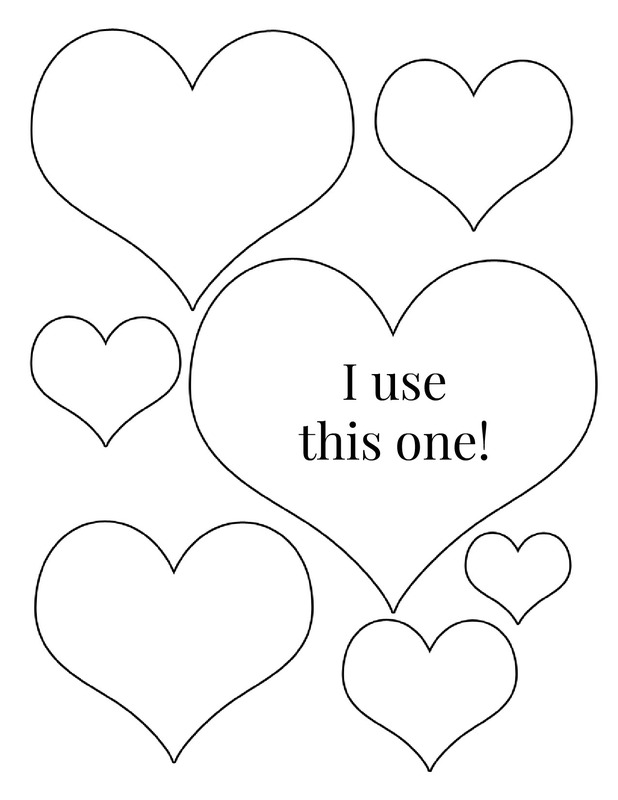 Make a heart template out of heavy cardstock or cardboard. This makes it much easier to trace. 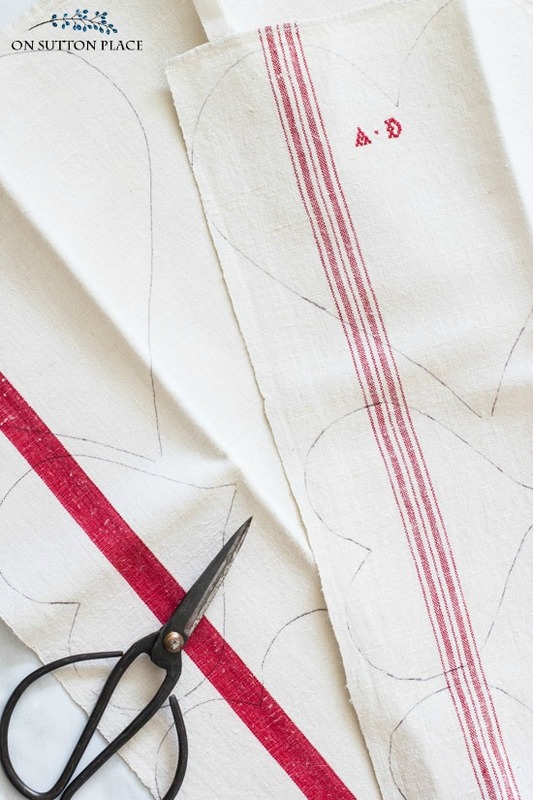 Being mindful of the grain sack stripes, trace a heart on your fabric and cut it out. Cut inside the marking line so it doesn’t show on the finished heart. Cut a piece of backing fabric. The shape doesn’t matter, it just needs to be bigger than the heart. With WRONG sides together, sew the heart to the backing fabric. You can sew the heart by hand or use a sewing machine. If desired, insert a piece of cording into the “V” of the heart to use as a hanger. Leave an unstitched space on the side of the heart. This space should be about the width of a spoon. After filling the heart sachets, sew up the unstitched space. Carefully cut out the back side of the heart. 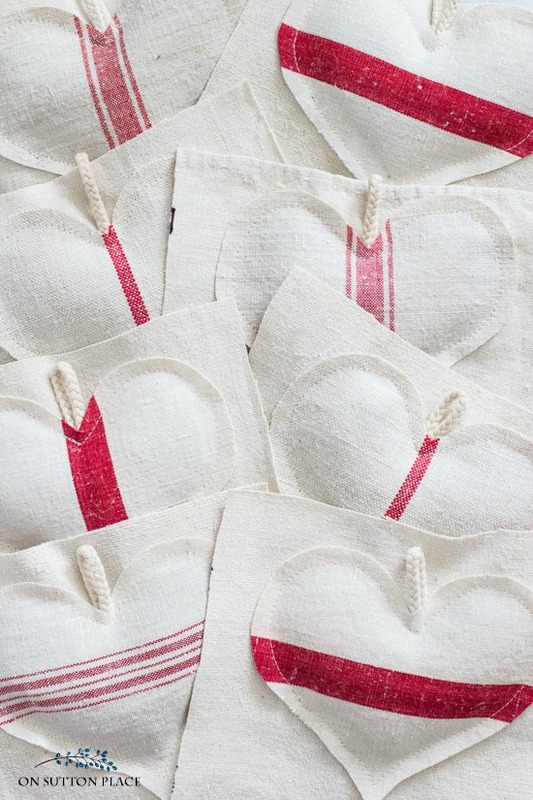 Back when I was sewing for my Etsy shop, I made hundreds of grain sack hearts. Some were sachets filled were lavender, some were ornaments filled with stuffing. Some had blue stripes and some had red. Of all those hundreds of hearts that I made, I didn’t save even one for myself. I have wanted to share this project for a long time, but more than that, I wanted to make some hearts that I could keep. I love the way they look in the basket on my blanket ladder and the light scent of lavender is so wonderful. I listed my best grain sack sources in this post: What You Need to Know About Grain Sack Fabric. I hope you enjoyed this post as much as I enjoyed writing it. I loved the sewing, the photography and writing the tutorial. These take a little time, but the end result is totally worth it! 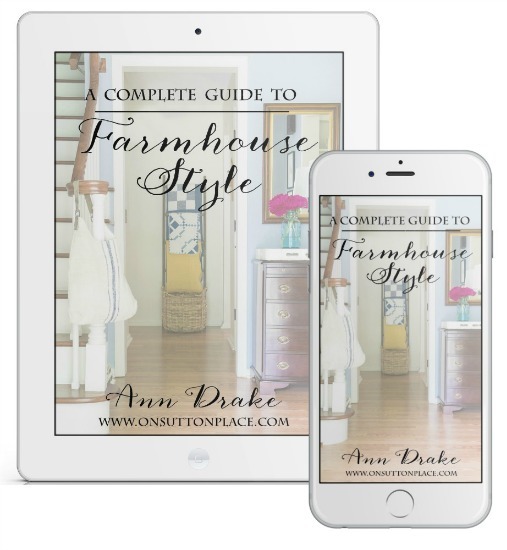 Get my free Guide to Farmhouse Style! These are adorable. I have some lavender I grew and some old linens. I think I will pull them out and make some, too. Thank you for the instructions. But this idea is darling! I’d love to do it to go with the quilts I make…. Love them!! When you cut the back fabric to match the front does the fabric fray? Hi Janice…no I have never had the fabric fray. If there are any loose strings they can be easily snipped. Thanks for this great idea, Ann. I have lavender buds that I harvested from my yard, and some old, worn tea towels. I’m all set for my next snow day project. I purchased two linen sachets from you when you had your etsy shop, and they’re still in my linen closet. Thanks for all the wonderful things you do! I enjoyed this very much! I would like to see some up for my home too! Thanks for sharing! I love those! So simple but unique. I think I will try making some. Thanks Ann, this is a great little project and i love the smell of lavender. 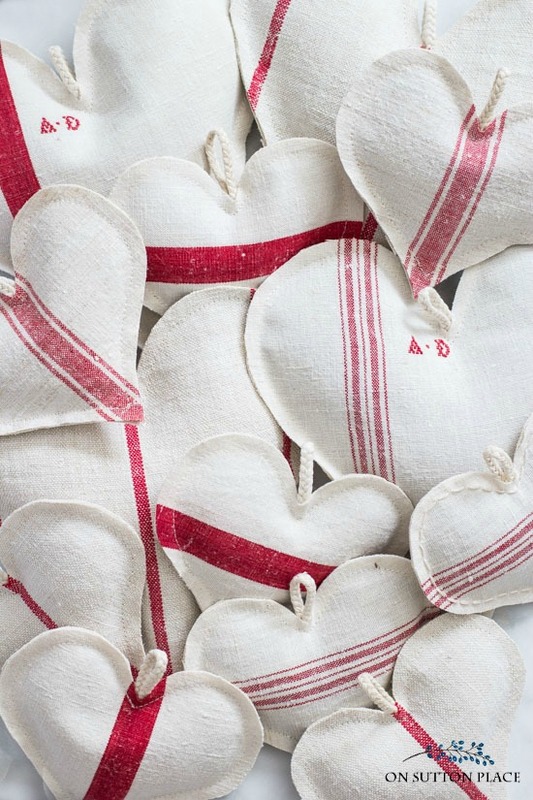 Thank you for your handy hints on creating these beautiful grain sack hearts. I particularly appreciate the hint about cutting the back for the heart as a larger rectangle, sewing the wrong sides together and trimming. That makes so much sense and gives a great finished look to the whole project. I’m also glad you made some for yourself to keep! We crafters tend to give our goods away to all our family and friends. It’s good to hold something back, now and then. Enjoy! Love that grain sack look! Those sachet hearts are beautiful. Where do you purchase your lavender ? Hi Jacqueline…either on Etsy or Amazon. There’s a link in the post! I love the valentine hearts!!! So I am determined to get back on the site to get the grain sack fabric. I wanted to buy it with the ribbon tutorial, but life got busy. Maybe I will get lucky and find some with a tiny monogram! This will be a great weekend project!!! I love the crispness of the grain sack fabric and the neat way you sewed these. They are so pretty and clean looking – and show evidence of your skill !! Thanks for sharing and I’m glad you kept some for yourself. These make great Valentines Day Gifts. Flowers are so wonderful but a small gift like these hearts last a long time. I keep mine in my lingerie drawers and they smell so nice. Your work is always beautiful AND inspires me to craft! Thanks for the valentine heart post…it’s a keeper!! I love these! I would like to purchase scissors. Love them!! Brilliant. 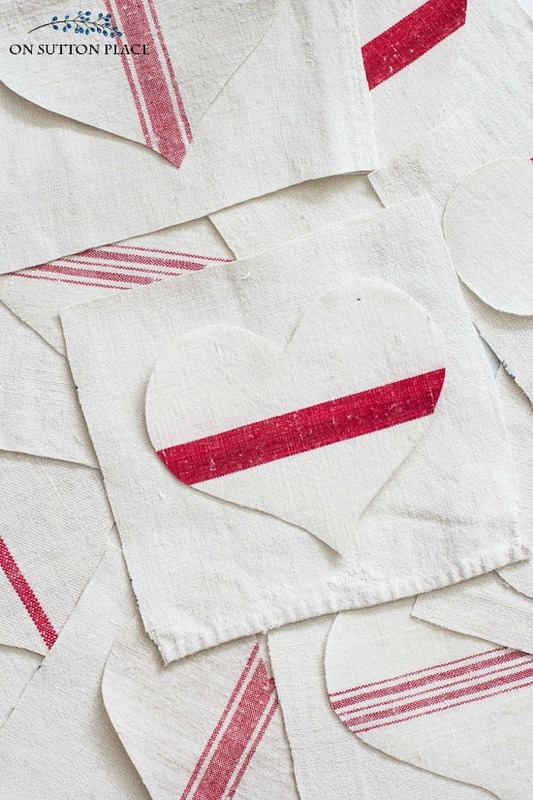 It never would have occurred to me to cut out one heart, sew it to a square or scrap piece of fabric and THEN cut around it to get the perfectly matched hearts. I will be using this shortcut in the future! Thank you. 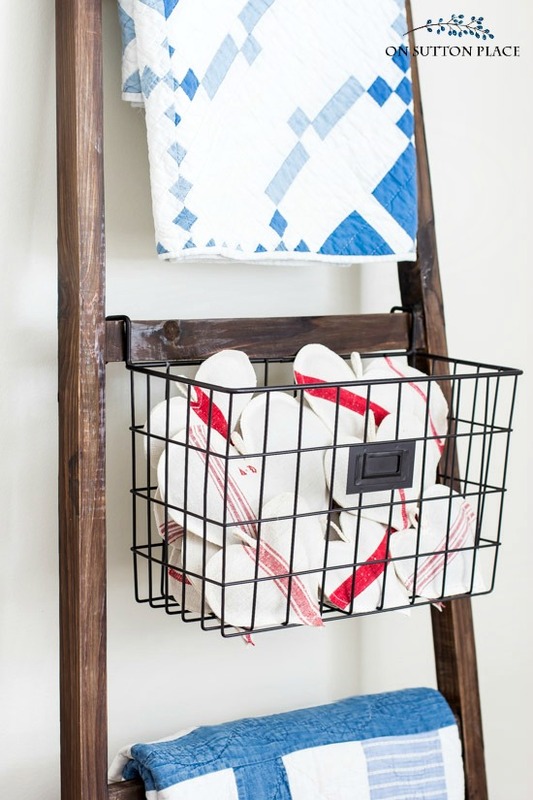 Where did you purchase your blanket ladder from? I can’t wait to try these with my new sewing machine! I look so forward to receiving your e-mails, they are always full of great ideas! Thank you! Thanks Ann for offering this. Just in time for that special day. I have been mentally fussing about little gifts for my quilting friends. We meet weekly and each try to present something special. This will suit the project nicely. Happy Valentines Day. *I purchased towels (several packs) at IKEA some time ago that have a similar texture to antique grain sack fabric. I use them when making pierogi! They will be just right. Dear Ann, I can’t wait to sew up some of these sweet sachets. They are lovely as everything you do. Thank you for sharing. You are always so generous. Your handy work is always so spot on neat! I am curious as to your suggesting to sew WRONG sides together, yet not turning RIGHT sides out…as I see the hearts have seam allowances (shabby effect) out. I like that look, but wonder why WRONG sides together, then not turned vs. RIGHT sides together and not turning? These little hearts are really hard to turn. I used to turn little Christmas stockings and it’s very time-consuming. The raw edge adds a bit of a farmhouse, vintage look that I like. Since they aren’t turned, by sewing the wrong sides together, you get the right sides on the outside where you want them. Hope this makes sense! Hi Ann! Well…duh!! After I read and re-read your gracious reply…i realized what you were talking about, by sewing WRONG sides together, and leaving the RIGHT sides displaying and “shabby/vintage/farmhouse” edge outside the seam line! I’ve been sewing for years and guess I was “presuming”:-) LOL! The valentines are beautiful! Thanks for sharing! These are adorable, Ann. I would been squeamish about cutting these up so I assume they had a stain of some sort. Your sewing is impeccable. I somehow lost touch with your blog. I’m putting it back on my blog roll. Don’t be squeamish. I love repurposing vintage fabric! I love the little hearts and I’m sure that smell of lavender is wonderful. I’m embarrassed to say, I never thought of sewing a pattern like that to a bigger piece of fabric. Duh! I would have struggled to sew the two shapes together. I love the hearts in the basket and good for you to make something for yourself to enjoy. The hearts are beautiful. I have a couple of old tea towels from my mom. Now you got me to thinking of a new project coming up! Love your posts. PS, I now have your recently posted house pictures on my living room wall. Love them! Thanks. Thank you for the tutorial Ann. Great tip to cut a larger backing! Spending this bitter cold day preparing the hearts to be stuffed. Appreciate the link to the lavender buds. Have a cozy day! These are so cute! I can’t wait to sit down and make up a few. Thanks for sharing this idea! Love them and you make it look so easy — If I ever find pretty grain sack, I will try! Since we are having a winter snow and ice day and I cannot get to work this will be a good project for me today. I have some cloth napkins that will be perfect for this. Appreciate you and how you keep us inspired. Hope you are staying warm this winter. I love this project, and those hearts. I have your grain sack ornaments from several years ago. Oh how I miss your online shop. I can’t believe you found a grain sack with your initials. What a lucky find. I still enjoy your posts, but don’t write often. Stay warm and enjoy those sweet hearts. Your version of Spell Check must have been raised in the South. Your hearts are just beautiful. I love that each one is different from the other. Thanks for the tutorial. Really great idea! So cute! And, you’ve reminded me that Valentine’s Day is around the corner. These are beautiful, Ann. Thanks for the tutorial. I’ve got some fabric scraps I’ve been wanting to use for something and this is the perfect project for them. I just love these!! I am guilty of the same thing- making for others and not keeping for myself! :) So glad you were able to make some for you! They look so pretty in your basket! And I love the tip on cutting the backing bigger- great idea! Thanks for sharing! 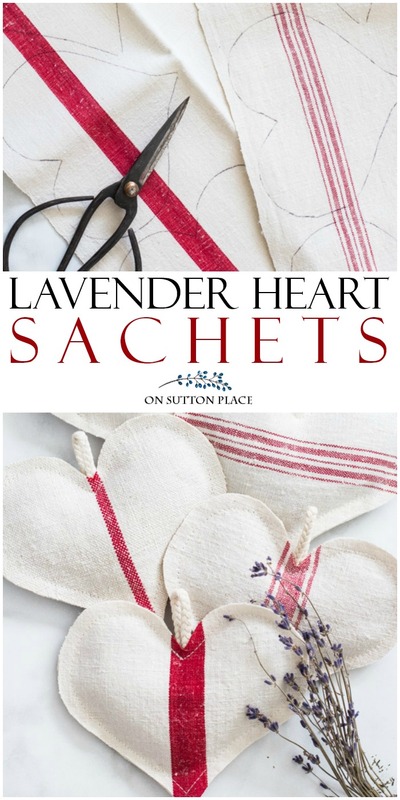 I have your lavender sachets you made about six years ago in my drawers and just love them. Sometimes when I can’t sleep, I grab a sachet and shake it a little and smell the lavender. I do think it helps me return to sleep. Your red hearts are perfect for Valentines Day.